When I think about vegetarian dinners, my mind always drifts to spanakorizo. I have no idea why, but it does. Whether it’s served by itself or with a piece of baked salmon, there is nothing more filling (and delicious) than this Greek rice-and-spinach dish. Put it next to zucchini fritters and you’ll freak out. The process (steps, instructions, something?) for this dinner is super simple. It’s a lot of chop-dump-stir, which is perfect for this busy grad school foodie. But the results are very impressive and it seems like you slaved for days over the stove (when the whole dinner takes about 45 minutes start to finish). Ultimately, it’s a win-win for everyone! Grab two medium zucchinis and grate them on the big side of a box grater. 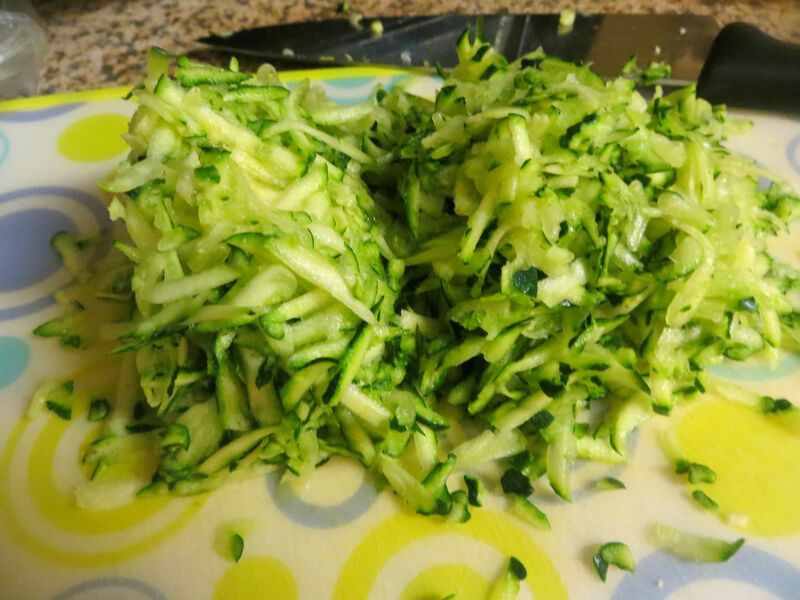 Resist the urge to start eating the raw zucchini from the cutting board (am I the only one who likes raw zucchini?). Wrap the zucchini in a CLEAN tea towel and wring out as much liquid as possible. The zucchini should shrink by about half. Dump the zucchini into your favorite falafel mix (that’s been prepared according to the box instructions) and stir to combine. Let the mixture sit for 5-10 minutes to let everything meld together. In a large, high-sided skillet, pour in enough vegetable oil to coat the bottom. Portion out the falafel mixture (mine were about ¼ cup each) and form them into patties. Fry the patties in batches. Cook 2-3 minutes on one side (or until they are golden brown), flip, and cook for 1-2 minutes on the other side (or until they are golden brown). If you have kiddos or pets, please make sure they are not near the stove when you fry! The oil is super, duper hot – please make sure it doesn’t come in contact with the little ones in your house. Place on paper towel-covered plate to let the excess grease drain. Try to resist snacking on these while you pull dinner together (plus they are nuclear hot when they come out of the oil, so please be careful!). Spanakorizo is exactly what it’s name translated to – spinach rice… with a few other things thrown in. Start with a large, high-sided skilled and heat one tablespoon of olive oil over medium heat. Add in one finely diced onion and 2-3 cloves of minced garlic. Cook until soft – about 5 minutes. If you want to give your dinner a kick, you can add some red pepper flake here too. When the onion-garlic mixture is soft, add in one 11-16oz box (or bag) of baby spinach (depends on what your grocery store carries). I recommend finding the biggest container of baby spinach possible. Because it goes from this…. … to this in a flash. And spinach is so good for you! So a little extra is always a good thing. Toss in 2 cups of leftover cooked brown rice. Like I said yesterday, this is a great way to use up leftover rice and the tomato sauce really revitalizes the brown rice. And brown rice is so good for you! (Confession – I probably dumped in 3 cups of rice, which made mine really rice-y… it was good, but the balance was kinda thrown off. A little less rice is much better). When the rice and spinach have a second to hang out together, pour in a 28-oz can of crushed tomatoes. I used crushed tomatoes with basil, but use whatever you have. Stir together, add salt and pepper to taste, a little dried oregano, and if you would like, a good handful of chopped fresh dill (I used probably ⅓ cup of dill). Let this mixture simmer for 20 minutes, or until the rice is tender. Serve the spanakorizo with a good squeeze of lemon over top, two zucchini fritters, and some tzatziki (Greek yogurt sauce). I hope you all enjoy this Greek vegetarian staple as much as I do!